Addict 2 Athlete is giving members of The Salvation Army’s Adult Rehabilitation Program a boost. But for participants at The Salvation Army Adult Rehabilitation Program (ARP) in Albuquerque, New Mexico, the trendy fitness regimen has become a critical part of their recovery from drugs and alcohol. And it’s yielding some positive results. Two days a week, ARP participants take a bus to Duke City Fitness for a 90-minute workout, courtesy of Addict 2 Athlete (A2A), an exercise program for recovering addicts. After each session, which incorporates high-intensity interval training, weightlifting, plyometric exercises, circuit training and much more, the participants take a corner of the gym and hold a counseling session. The partnership formed as a result of a vast network of people across state lines who believe in the power of exercise to help people accelerate their recovery and maintain sobriety. 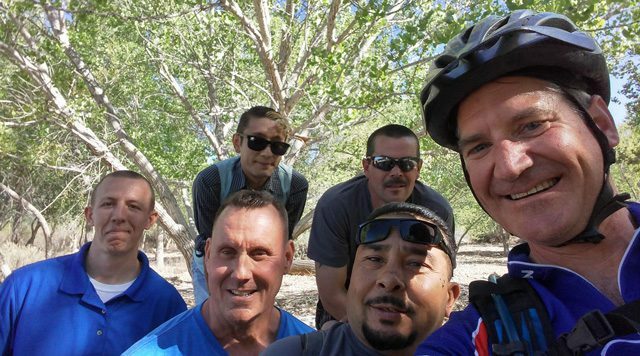 “We were trying to get our addicts to exercise, but it was difficult,” said Major Raewyn Aspeitia, County Coordinator for Albuquerque and ARP Administrator. While many participants had some sort of workout regimen in place, they had trouble ensuring it laddered up to their recovery. Tim Allen told Aspeitia about a program he was participating in called Addict 2 Athlete. Allen is a licensed drug and alcohol, and mental health counselor for the New Mexico Christian Counseling Office, which provides counseling services for the ARP. Allen also works with Elise Padilla, Executive Director of the Albuquerque Center of Hope and Recovery, a nonprofit that provides mental health and substance abuse recovery services to New Mexico. She facilitated the connection with A2A through her own network, and wanted to bring it to Alburquerque. “I said I wanted to be on board with it,” Allen said. Not soon after he began facilitating the program, he realized he could loop in the ARP. Recovering alcohol addicts have proven to have significantly reduced cravings for alcohol during moderate-intensity exercise. Having a social network unrelated to substance abuse helps also prevent relapse, and group exercise has been shown to help improve communication skills, conflict management, and frustration tolerance in addiction recovery. When Allen was in school pursuing his master’s degree, he wrote a paper on relapse prevention, and the part that stuck with him was the effect of exercise in easing mental health issues, such as anxiety, depression and bipolar disorder, he said. According to the World Health Organization, 15.3 million people suffer from substance abuse. Studies also find that certain moderate and high-intensity aerobic exercises can aid in recovery from substance abuse. “I really, really believe in exercise and how it helps change our minds and our brains and makes us feel good,” Allen said. And he knows from personal experience. Allen is 16 years sober, but his early days of recovery—and the extra push exercise gave him to heal—are still fresh in his mind. The neurotransmitters that are manipulated by drugs and alcohol are the same ones that get kicked into your system when you exercise, Allen said. It really does make you feel better. While the A2A model is built on that same foundation, program officials encourage satellite groups, such as The Salvation Army’s ARP, to tailor the program to their own needs. “We provide the meat and potatoes and they season it the way they want,” said Rob Archuleta, founder of A2A in Pueblo, Colorado. Archuleta, who holds a bachelor’s degree in sociology with an emphasis on criminology, now focuses more on counseling and is a certified chemical abuse counselor, and child and family investigator. The eight-week A2A program is built around eight criminogenic needs—such as parenting, residential stability and stable employment—which, if left unmet, are considered to be linked to criminal behavior. Archuleta, who developed the program based on his own experience with rehab, said he doesn’t quite align with the idea of substance abuse as a disease, mostly because drugs are against the law. Responsibilities such as parenting, for example, don’t quite work one day at a time, he said. The A2A model offers a daily, tangible goal: Complete a workout. CrossFit, in particular, is scalable for all fitness levels. “It allows a two-month sober person who hasn’t built up the fitness yet to work out with someone who is two years sober, and you’re all done in 20 or 25 minutes,” Archuleta said. Exercise is a part of it, but there’s half an hour of education either before or after workouts, Archuleta said. That’s where facilitators and mentors, like Allen, come in. “I help them see the correlation of how they’re feeling and how exercise changes their mood, if they’re having negative emotions or anger,” Allen said. While The Salvation Army’s A2A group is still in its infancy, the early results are promising. Among the initial group of graduates, only one person has dropped out, Allen said. And once they finish the ARP, graduates have the option of returning to A2A sessions. “If they want to stay connected [after graduating], they can join on Tuesdays as mentors to take care of the new members, greet them and teach them how to work through it,” Allen said. Otherwise, the results show in the participants. They’re feeling better about themselves, seeing changes in their bodies and interacting with “normies” (a term of endearment for non-addicts at the gym). Sheena Archuleta, CEO of A2A in Colorado and in her 12th year of sobriety, said that, above all, she wants the program to cut through the stigma of addiction. Thank you so much. Can I please have a hard print copy? Hi, Elise. Yes; we will email you a PDF of the story. Thank you!